While Tokyo has seen a wave of serious-minded Neapolitan pizzerias open over the past few years, anyone in search of some NYC-style pie will have to go to much greater lengths to get it. Maybe even as far as Oji, which since 2010 has provided a home to the oh-so-homey Rocco's. With its red-check tablecloths, open kitchen and ready-cooked slices sitting in a display case on the counter, this American-run pizza shop certainly looks the part. 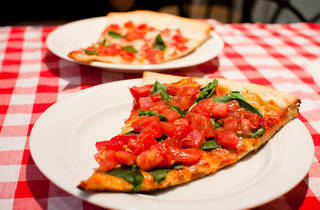 Pizzas are sold by the slice (from ¥390) or in medium and large versions (14" and 18", respectively). Try the spinach and fresh tomato if you're looking for something light, or opt for the meat lover's – pepperoni, Italian sausage, ham and wiener – if you want a real gut-buster. 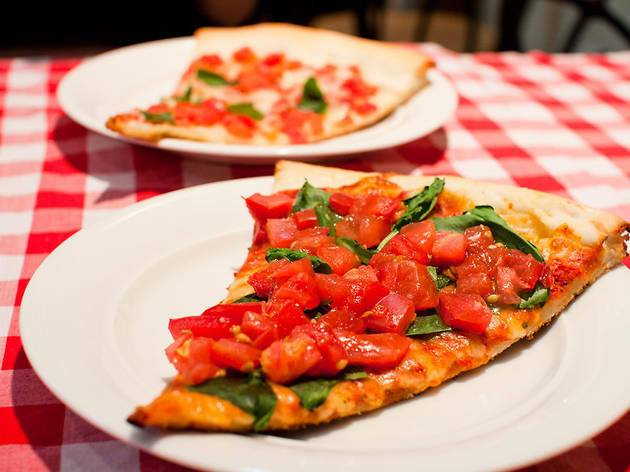 After months of chomping Italian-style pizzas, it's refreshing to have one that you can pick up without worrying about spilling the topping everywhere, and the slices at Rocco's are winning: crunchy on the bottom while still fluffy on top. The menu also stretches to Buffalo wings, potato wedges and cheese cake – and yes, they screen sports games on the widescreen TV too (check the schedule on the website for details). Update: as of March 2016, Rocco's is back to being open Tue-Sun – check their Facebook page for the latest.